We do not curently have theatre tickets available for Spear of Destiny. This could be because we have simply sold out or it could be that this show is no longer running. The information on this page remains purely for historical and informational purposes. Their debut album "Grapes of Wrath&" from 1983 featured the anthemic single "The Wheel&". 1984's follow up LP "One Eyed Jacks&" featured the singles "Prisoner of Love&" and "Liberator&" which are live favourites to this day. 1985's "World Service&" cemented the band's reputation but it was 1987's "Outland&" album featuring the top 20 single "Never Take Me Alive&" which widened the band's audience. It was this year that Spear of Destiny supported U2 at Wembley Stadium. 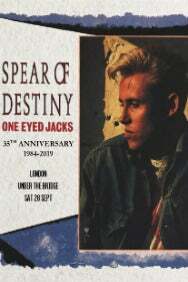 Spear of Destiny have always been known for their dynamic live shows. Book your tickets today to see one of the UK's finest live groups.